Craft Stamping Quartet: On The Cover ................ not quite! I hope this evening finds you refreshed by the recent rain but not downhearted by it. Personally, I am so relieved it has cooled down although my craftroom/conservatory has still been unbearably hot. Oooh, I'm such a spoil sport when it's hot! Well, tonight it's my turn to post my project for this month and as Sue correctly guessed from my earlier teaser I chose Hels Sheridan's 'On The Cover' project from the April 2011 issue of Craft Stamper for my inspiration together with the lovely colour palette Judith chose for us to use from Rachel Jackson's Designer Palette in the May 2011 issue. I didn't adhere strictly to Hels' wall hanging because I didn't use the Craft Stamper free cover mount stamps but instead spent ages going through my stamp collection to find the ones I wanted to use. 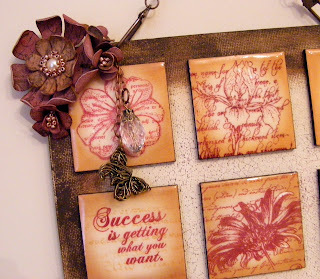 I did use one of the cover mount stamps but the rest were a mix from Chocolate Baroque, Paper Artsy,Creative Expressions and Inkadinkado for the main Stampbord images, Stampers Anonymous for the background script and finally a new company called IndigoBlu for the crackle background on the canvas. The first problem I encountered was finding suitable ink colours in my quite substantial collection. I actually had both the Umber and Burgundy inks but one was a cube and the other a cat's eye and both were so old they were too dry to use so I had to look for alternatives. I finally settled on Coffee Archival, Parchment Paris Trunk and Aged Mahogany, Vintage Photo and Walnut Stain Distress Inks. I love working with Stampbord so inking and stamping the tiles before covering them in UTEE was a real pleasure to do. I do have a question for any Stampbord experts though. I really enjoy doing the highlights with a scratch tool but even though I usually give the piece a blast of the heatgun to make sure the ink is thoroughly dry, as soon as I cover it with UTEE the highlights just about disappear and it really annoys me. If anyone has a tip on how to stop this happening I would be grateful to hear it. 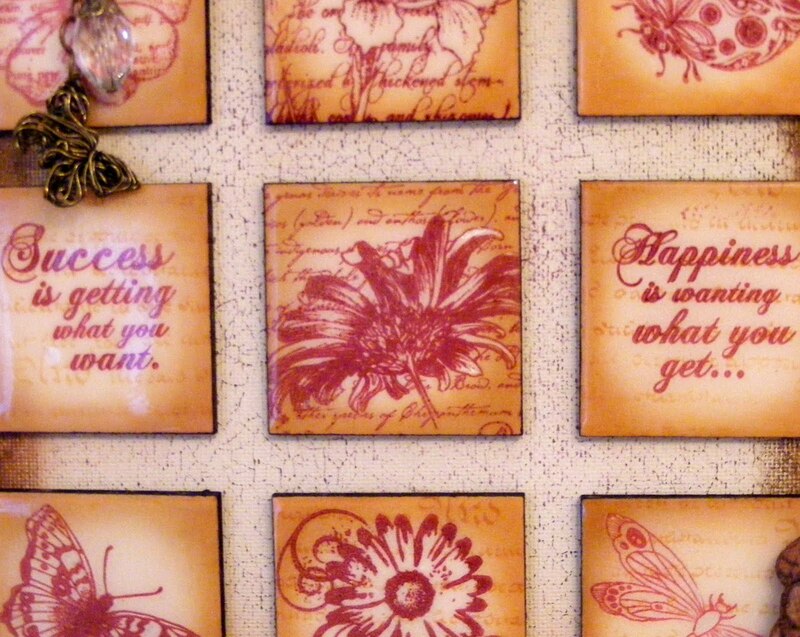 I actually forgot to sand the edges of my tiles before embossing them, lol! To colour the middle of my canvas I found it was taking far too long (and too much ink from my precious pad) using the Parchment Paris Trunk so I mixed a very pale creamy colour from some acrylic paints and covered my canvas with that before inking round the edges with Vintage Photo and Walnut Stain. I used a babywipe to take some of the ink from round the edges as I wanted it to look patchy. 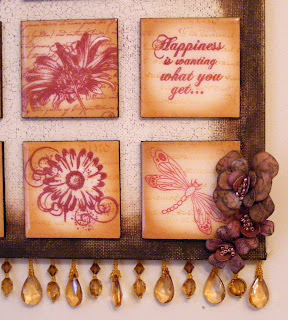 I did this instead of the UTEE that Hels added to her canvas edges and also stamped the fine crackle (I stamped off onto scrap first so that the ink wasn't too dark). 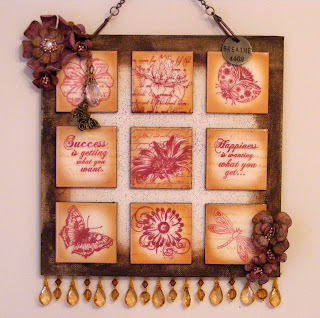 I used a Chocolate Baroque flower stamp in two sizes to make my Grungepaper flowers and then filled the middles with Glossy Accents before adding some tiny gold beads. I had the perfect beaded fringing in my stash plus the gorgeous steampunk butterfly and a lovely crystal type drop and finally some Ideology bits. The other mistake I made (hmmm, they say confession is good for the soul, lol) was forgetting to punch the holes in my canvas board BEFORE I stuck the tiles on. I had a heck of a job getting the Crop-a-dile at an angle that wouldn't damage the tiles when I squeezed to punch the holes. Well, that's my offering for this month. I thoroughly enjoyed making this so thanks to Rachel for the lovely colour combo (even though mine is not quite the same) and Hels for the project inspiration. As always thankyou for visiting and for any comments you have time to leave. I don't think it will be long before the next one of my buddies is ready with her project so keep an eye out for the post. Wow! I love this Lesley! I really like your different images and how your mounted them, not to mention all of the beautiful embellishments too! good idea to cover the canvass with acrylic ink and not favourite inks. I love my paris Trunk sepia ink... reaching for it all the time. Beoooootiful Lesley! Thank you so much for jumping right in and making a wonderful piece of art in your usual gorgeous way. You and Jo have both made such stunning pieces, I hope mine lives up to the task! I love the beaded fringing, it's lovely, and the flowers are fabulous. 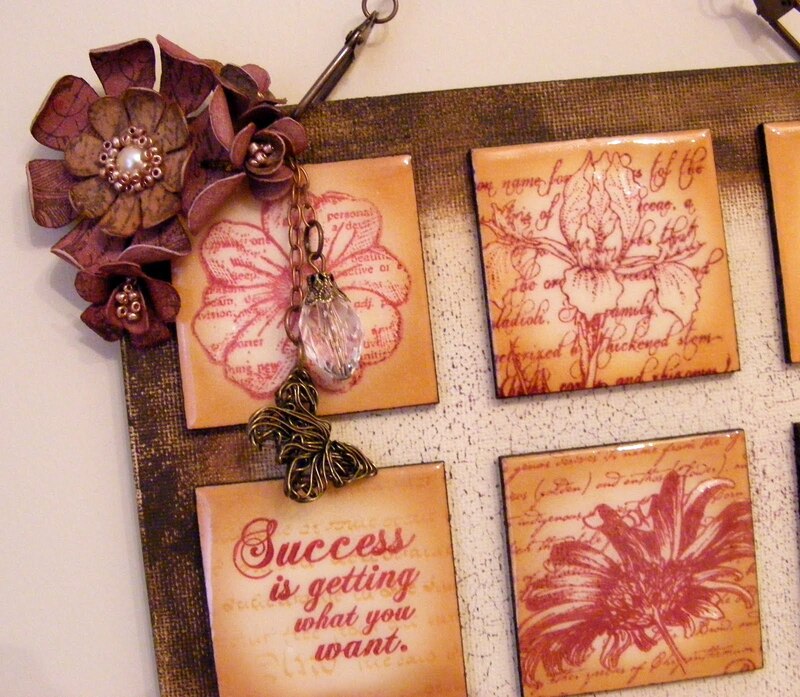 The Stampbord tiles are all delightful, each one is lovely in its own right. Your colour choices are great, it's not easy, is it? It's lovely to see some stamp 'friends' in there too, the beauty of a piece like this. Well Lesley, another gorgeous project. Great use of those colours, super choice of stamps and the embossing adds an extra dimension too. I love the addition of the amber beaded fringe it really adds extra light. Your grungepaper flowers are really lovely. I very nice project indeed. I had better get my finger out with my project, it certainly won't be me who posts next! This is gorgeous Lesley and the beautiful flowers and beaded fringe and other embellishmentsfinish it off nicely. Great choice of stamps (particularly like the choice of words). I say hooray for slightly cooler temperatures today too!! A beautiful project Lesley, a lovely combination of flowers and the prettier insects, with some great sentiments. Finished off perfectly with the beading and grunge flowers. Fabulous, Lesley. I know you feel you are still finetuning your Stampbord techniques but I've always thought you the Stampbord Queen and this is another stunner.You have really made those colours work for you. I love that you have made that frame so bold but then left the centre so pale. The flowers are very Hels and they add so much to the overall effect. You've made a real treasure. I know your family and friends are quite adept at 'acquiring' your pieces after taking a fancy to them and I'm expecting to hear that it is hanging on someone else's wall very soon. I think you should be selfish and hang on to this one as long as you can. This is totally stunning Lesley. I saw the "taster" on your own blog but never expected your finished project to be anything like this. How amazing!!! I love your colour choices and each and every single piece of stampbord .. .. each one is a work of art in its own right! I have to admit to having a pack of stampbord that I haven't opened yet!! I don't want to waste it by doing something naff with it. I'm thinking I need to get it open and at least try!!! I love your art. Enjoyd looking around on your blog.